Remember, around New Year’s, I mentioned an archaeological mission to see ancient log coffins in northern Thailand? Quite a trip, that was. The article is out in this month’s Archaeology. And while the story covers the history and scientific significance of this rocky terrain up near the Burmese border, it doesn’t say much of the fabulous Shan food we ate while on the job. Take, for instance, a quick little roadside lunch in Tham Lod village, where we spotted a few hot pots of steaming pork and a rich, smoky tomato-y sauce to be spooned over rice noodles with fresh cilantro and crispy fried garlic. Perfect ender to a morning of exploring a nearby cave with a centuries-old chedi inside. You’ll find numerous versions of this dish spanning the hills that stretch from Burma’s Shan State, through northern Thailand and into Laos. 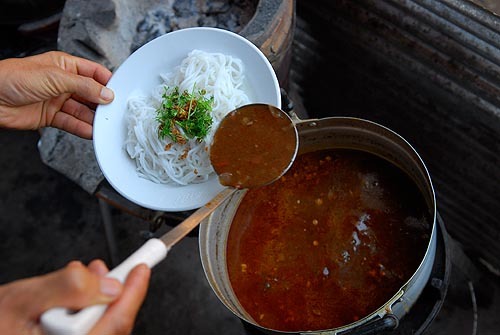 One cold winter morning in Shan State, we ate an exquisite bowl of thick, round rice noodles smothered in a toasty broth using a paste of tomato, fried garlic and chile. 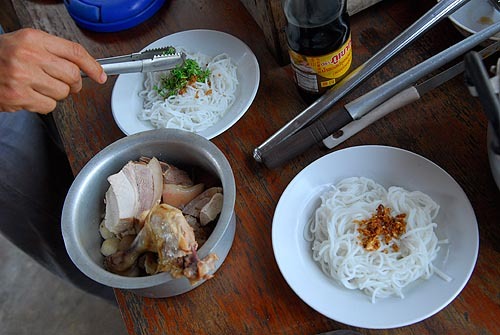 The locals called it khao soey “sweet soup,” distinguishing it from other noodles. “Tomato makes it different,” our guide, Sai, told us. It reminded me of another crisp morning on the Mekong in Laos, where I had a similar zippy dish. I was so taken with those noodles, I asked for a recipe at the Tamarind cafÃ© and cooking school. So simple! Make a soup stock by boiling pork bones. Meanwhile, mix chopped pork with fermented soybean, fish sauce, chile, garlic and tomato. Let sit 20-30 minutes until the flavors permeate the meat. Add to the soup, pour over rice noodles and serve with lime, lettuce, mint, green beans, watercress, cilantro and crispy rice cakes, if you desire. This is Lao kao soy. The name is evocative of the kao soi (or khao soi) that in many ways makes Chiang Mai famous. But you won’t find sweet coconut milk curry in these noodle dishes. What you will find is a lot more heat. I imagine a Southeast Asian version of my mother’s spaghetti (ground beef, onion, green bell pepper, tomato sauce, tomato paste). I imagine her packing up that sauce and trucking it halfway around the world, then letting it stew long enough to absorb the local flavors. First, make the two pastes separately by gradually pounding the ingredients together using a pestle and mortar, adding one by one, until smooth. 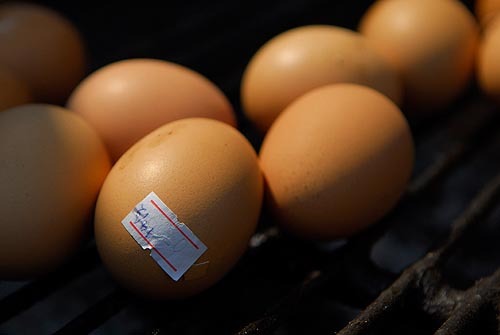 Eggs for sale, Ban Tham Lod lunch shop. My God I could eat that now! Off to get the book off the shelf! Wish the article went on in more detail and photos as that’s one of my fave magazines. I don’t see that many SEA archaeological stories. 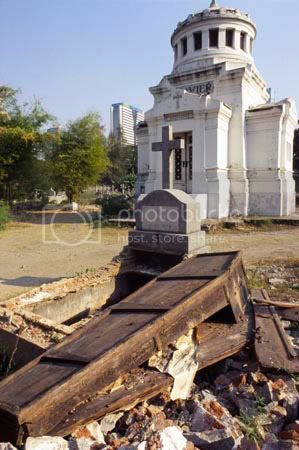 Those finds sound much more interesting than what I found in downtown BKK one time…not really archaeological per se. My guess (or maybe I should say hope!) is they were moving remains somewhere else. I’d never seen a scene quite like this. I wasn’t hungry after I’d walked around in there! Eric, I’m intrigued. Mysteries never cease in Bangkok. My Thai wife’s eyes bugged out when I told her of my “discovery” that day. “You actually went in there?” I never did find out what the story was about that place.